Spoiler Photos for The Moon Embracing the Sun – Hwon & Wol Run Away? The photos related to the plot of The Moon Embracing the Sun exposed, attracting people to make all kinds of speculation. On February 6th, 2012, a series of photos and text read “Super Plot Photos of The Moon Embracing the Sun” was published on an online bulletin board. The photos are stills from the scenes of MBC Wednesday and Thursday drama The Moon that Embraces the Sun that yet to be broadcast. 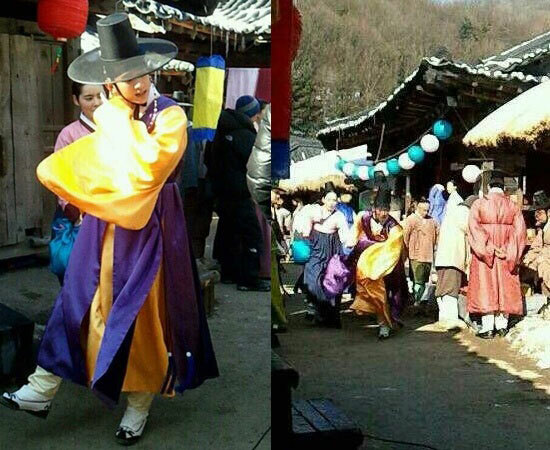 In a photo, Hwon (Kim Soo Hyun) and Wol (Han Ga In) are running on the street. Both hands of Wol carries parcels and holds tightly to Hwon. In another photo, both of them stops to rest and take a breather, showing bright smile on the faces. Netizens said, “Wol is expelled from the Palace, Hwon goes out of palace to chase her,” “Does not look like secretly dating,” “Two persons plan to run away to start a new love at a new place?” and so on, the response was overwhelming. The rating for episode 10 of The Moon that Embraces the Sun exceeded 37%, and its ratings are still rising.